The purpose of terror, Lenin once said during the Red Terror of the Russian Civil War, is to terrify. The term ‘terrorist’ was coined during the French revolution to describe Jacobin mass-killing of ‘counter-revolutionaries’ at a time of crisis and revolutionary war. In the late 19th century the term morphed into a euphemism for non-state groups when it was adopted by French anarchist and Russian narodniki groups who used the bomb and the assassins bullet to terrorise the ruling classes. Here in Ireland, as Shane Kenna’s interesting article tells us, the Fenians had the dubious honour of pioneering modern ‘terrorism’ with bomb attacks in London in the 1880s. Today, when the term is almost always an epithet of abuse, NATO defines terrorism as: “Premeditated, politically motivated violence perpetrated against non-combatant targets by sub-national groups or clandestine agents, usually intended to influence an audience”. This is clearly far too narrow a definition, as it excludes states themselves – including Robespierre and the original ‘terrorists’. In El Salvador for instance, during the civil war of the 1980s, out of 75,000 fatalities at least 40,000 were civilians sought out and murdered by either by the country’s police and military or groups under their protection (Another 8,000 people disappeared without a trace). If this does not count as terrorism and the leftist insurgency of the FMLN does, the phrase tends to lose all meaning. So a more comprehensive definition of terror would be violence against non-military or disarmed targets by state or non-state actors with the aim of terrifying or otherwise intimidating a wider group of people for some political end. Going by this definition, Ireland, during the upheaval of 1916 to 1923 saw various types of violence – rioting, conventional warfare, guerrilla warfare and also terrorism by both state and insurgent groups. This book Terror in Ireland might therefore have been more usefully called ‘Political violence in Ireland’, to encompass all of these phenomena. The use of the term ‘terror’ and ‘terrorist’ does tend to imply a political or moral judgement. 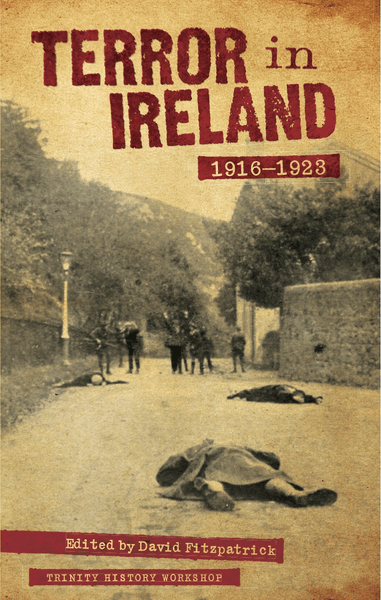 Brian Hanley in a well rounded opening chapter on violence in 20th century Ireland, identifies state as well as non-state terror, including that practiced by the Free State during the civil war, including executions the assassinations by the CID, the use of force on strikers and so forth. He notes how Provisional IRA’s use of indiscriminate car bombs was a new departure in Irish political violence and undermined much of their support, and closes by noting the serious lack of research into loyalist paramilitary violence, both in the 1920s and in the 1969-1998 conflict. Eunan O’Halpin’s chapter, based on his research in the Dead of the Irish Revolution project, shows in newly complied statistics that Crown forces killed significantly more civilians than the IRA in 1919-21 (381 compared to 281, the culpability for a further 236 civilian deaths was impossible to attribute). Similarly Fearghal McGarry’s piece on the Easter Rising suggests that the rebels’ violence was actually much less indiscriminate than the British Army’s in 1916 and they deserve their chivalrous reputation to some degree. Some chapters offer very interesting micro-studies of the War of Independence, including Ross O’Mahony’s description of the Sack of Balbriggan by the Black and Tans and its aftermath in North County Dublin, Michael Murphy’s survey of the revolution in Kildare – where nearly three times as many people were killed in the civil war as in the war against the British – Justin Dolan’s piece on prison violence and Gerard Noonan’s on Republican Terrorism in Britain, which describes the IRA’s extensive campaign of arson and sabotage in England and Scotland. Some chapters are somewhat critical of ‘terror’ as a political weapon. Anne Dolan in characteristically philosophical mood, writes about the nature of terror in the War of Independence, a war in which both sides called the other ‘terrorists’. The logic of shooting informers and publicly displaying the bodies for instance was to terrify other potential informers and enemies of the IRA. ‘Terror rippled out’, Dolan writes, and describes its effect on civilians and loved ones of those killed as well as the psychological effect (more than military) on Crown forces. Jane Leonard’s chapter recounts in painful detail the biography of each British officer and civilian killed by IRA on Bloody Sunday 1920 – claiming that most were not Intelligence officers at all. Thomas Earls Fitzgerald’s piece describes the IRA shooting of informers in west Cork, 1921, noting that 8 out of 10 victims were Protestants, while Brian Hughes shows how intimidation of RIC constables and their families could be considered a form of low-level terrorism. The tone in some of these pieces does seem more critical of republican than of state terror. Moreover, the civil war is under-represented – with the emphasis on British-Irish rather than intra-Irish confrontation. It is perfectly legitimate to criticize Irish political violence, both historically and more recently but it also important to acknowledge that terror often involves two sides. Finally, the most controversial chapter will no doubt be Eve Morrison’s reprisal of the Kilmichael ambush – the famous action where Tom Barry’s IRA column killed 18 Auxiliaries. Controversy has raged ever since November 1920 over this ambush – did the IRA wear British uniforms? Did they mutilate the dead? Was there a false surrender by the British? Did the IRA kill wounded and surrendered Auxiliaries? The late Peter Hart’s contention that there was no false surrender and that Barry had the surrendering Auxiliaries ‘exterminated’, has generated acres of bitter debate back and forth since 1998. Hart is often charged with faking the interviews he cites anonymously to support his version. Eve Morrison’s Chapter on the Kimichael ambush is likely to be the most controversial. Morrison shows, through interviews with veterans recorded by a Father Chisholm in the 1960s and 1970s (and subsequently used by Hart) and the Bureau of Military History statements of veterans, that some of Hart’s version certainly stands up. Auxiliaries were indeed killed while wounded and after they had surrendered and on Barry’s orders – the veterans leave explicit first-hand confirmation. But Barry tacitly admitted this all along. His key defence was that the Auxiliaries had faked a surrender and then killed several of his men, forfeiting their right to be taken prisoner. Morrison dismisses this outright but several accounts cited here do speak of some Auxiliaries surrendering and others continuing to fire when the IRA advanced to take them prisoner. This is not quite the same as Barry’s argument about a false surrender ploy, but he could well have interpreted it as such at the time. Most likely what happened was that in the chaos of combat, some Auxiliaries were indeed trying to surrender and others trying to fight on, leading unfortunately for them, to the death of them all. John Keegan’s The Face of Battle (1976) has a chapter devoted to the taking of prisoners which shows that exactly such lethal misunderstandings occur all the time in combat situations. In the Civil War the Free state forces made many allegations of false surrenders on the part of the anti-Treaty IRA when what probably happened was panicked and uncoordinated reactions by their fighters. However, it should be noted I feel, that whatever exactly happened at Kilmichael before the order to cease fire was given, once the Auxiliaries had surrendered and been disarmed they should not have been killed. Indeed taking prisoners in such situations was standard IRA practice in 1919-23. In only one other incident that I know of – the Dromkeen ambush in Limerick in 1921 where 11 RIC men were killed – were there credible allegations of killing of prisoners after combat (though a number of others were killed in reprisal for the execution of IRA prisoners). As for Peter Hart, as I have commented before on The Irish Story in relation to other controversies, his broad arguments tend to have much merit but he did tend to undermine them somewhat by exaggeration on important points of detail. In short, this slim book, based on a history workshop at Trinity College Dublin, has some chapters which will be controversial, but much material that is interesting and illuminating. Written by: John_Dorney on 3 May, 2012.on 22 March, 2017. 4 Responses to "Book Review: Terror in Ireland 1916-1923"
Should I be put off by the fact that Eoin Harris has praised this book? Fitzpatrick has a very angry attack on John Regan in the new History Ireland magazine. Does this book address any of the issues in his critique? On the first point I wouldn’t let Eoghan Harris dictate my reading habits if I were you! But seriously as I said in the review, there are some chapters which have a somewhat jarring tone – especially the one which provides in depth, even sentimental obituaries on all the British officers killed on Bloody Sunday, but there are other chapters which provide much that is new and interesting and is impartially delivered. It’s worth a look basically. On the second point, no, not really. There’s nothing specifically on the Dunmanway incidents (or John Regan) in this book. There is plenty defending thier colleague Peter Hart though, which I think from a personal point of view is perfectly understandable and from a historical point of view – well some of what Hart said about things such as shooting of informers in Cork and the Kilmichael ambush does hold up I think when checked against the sources. Whether his interpretations and conclusions are right is another issue.